I’m always glad I’ve updated to the latest and greatest OS X version that Apple provides, but I also always wait a week before doing so. When lots of stuff changes there are always some glitches that will need to be handled, especially on a developer box. I already discussed an issue with Xamarin in combination with XCode 6 and Yosemite in this earlier blog post, but as a mobile developer there are more tools then Xcode to use to create cool apps. This post will list all the stuff that i’ve encountered during the use of Yosemity. Let me know if you have encountered common glitches as well and post me the remedy and I will add them to this list. That is the message you will get when using Adobe Photoshop CS 5.1 (for image editing, duh!) or WireFrameSketcher, an awesome wireframe tool. 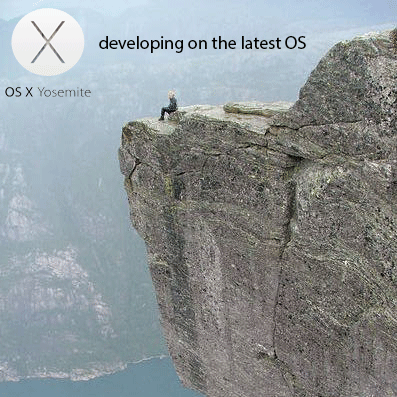 It seems that those apps work on version 6 of the Java Runtime and that Yosemite is cruizing on a newer – non-supported – version. Give your Safari back its developer-worthy URL’s! Okay, so Safari isn’t the BEST browser to develop and debug your stuff in. But when you develop websites and/or mobile apps on your Mac it is just useful to see the full URL in Safari’s top bar. Yosemity, by default, shows only the domain name to simplify things and you will need to click the url to see the full address. The fix: Make your URL bar dev-worthy again by going to Safari’s Settings > Advanced tab > Check the “Show full website address” option at the top. I’ll keep you posted if there’s more stuff to take into account when riding the Yosemity playground..